Have you seen it before, this fruit? It’s a verdant yellow-green, impossibly surface-wrinkled. It looks prehistorically striking, some handsome fist-sized fairy-fruit from a nether realm, a delicacy from a time forgotten. There’s a whole history here: Osage and Comanche peoples quested after these trees, prized their bright yellow wood, used it in traditional medicines for eye conditions, made bows and clubs. Now, though? We use its wood for fence posts and treenails. The trees form farm windbreaks, neatly-plotted hedges squaring off parcels of land, sharp-thorned branches deterring wayward cattle from wandering off. And the fruit? It’s merely a thing we look at and wonder about. We call it hedge apple and monkey ball and mock orange and we don’t understand what it is—why it is. Buffalo gourd, related to squash, are so bitter that cattle or donkeys will rarely eat them (and only, only, out of dire necessity). These fruits, in the wilds of the American southwest, rot and die off next to the plant, a cycle of decay. Pronghorns—whose closest relatives are giraffes and okapis—bound around the high plains of North America at over 60mph, dizzying speeds that make no sense now. There is no longer a living predator that can keep up, can even come close, though there used to be: the American cheetah. When the big cat died off, the pronghorn held on to their sprinting, and now, now, their hurry is only for show, a useless spend of energy. Helictopleurus giganteus, the largest, rarest dung beetle found in Madagascar, is entirely dependent on human feces. But: these insects used to rely entirely on the giant lemur, now extinct. Humans only arrived in Madagascar 2,000 years ago; and dogged as these beetles are, holding out long as they can, without us, they too would vanish from the earth, just be gone. So the Osage orange, like these other anachronisms, thrives now in some sort of phantom niche, propagated by humans alone, abandoned since the extinction of Pleistocene megafauna. Imagine it: once, beneath storm-pink skies, these fruits were feasted on by mastodons and short-faced bears and ground sloths and giant beavers. And, oh, friends, the Osage orange thrived there, it proliferated. It had purpose. Reason. It’s sad perhaps, when you think about it now, how it’s caught between worlds. This marvelously tenacious creature, a sublime hold-out; but what is it to not know your place in the world, so sure of where you’ve been, but not of where you’re going? 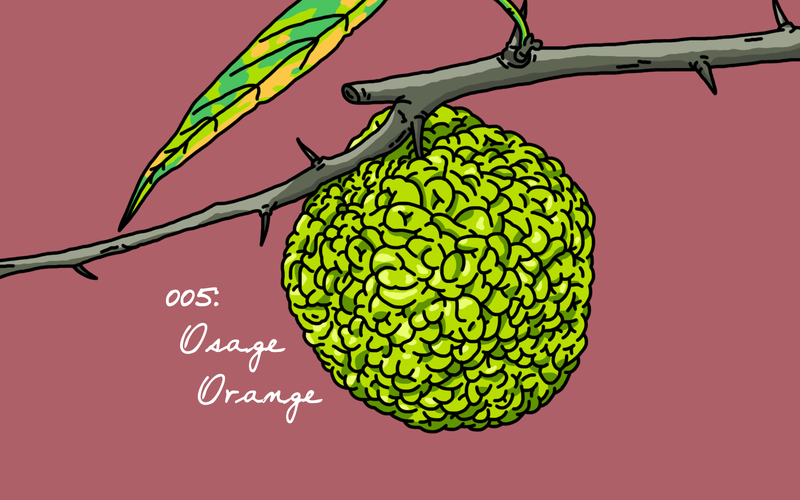 It’s okay to weep for the Osage orange, for honey locust and Florida nutmeg and Cuban crocodile and gingko and avocado and the California condor, for all these widows, these in-betweens. Yes, you might weep for them, you might, but really, it’s quite beautiful: they’re here, yet. Existing; being for their own sake. They hang on. They still have something to say.